The past couple of months have felt as a blur. Winter has proven to be a slow and challenging time of year to do any outdoor work, particularly relating to digging and pouring concrete. I originally had plans to work my two part time EMS jobs over the winter and resume fence work once the weather improved. However, I found that I would receive a slow but steady stream of requests for both installs and repairs that I mangled to support ourselves over the winter with little supplemental employment. With each client that contacted me about work during this time of year, I made sure to be forthright about my scheduling being at the mercy of the weather, particularly when concrete is involved. I found that every customer I did work for this winter was both very understanding and appreciative which has made this slow season a joy. Pictured below is a collection of photos highlighting the fence projects I completed this winter. The slower winter season has brought with it more time with my family and time to pursue other activities that are of value to us. Though we lived on a tight budget, we stayed with in our means. Some of the personal projects I decided to tackle this winter included building our boys loft beds, a wood shed, removed a textured ceiling and painting the boys room, built bird feeders and a "Little Free Library" (still in progress) and helped with a neighborhood project that involved local children painting plywood signs with messages to help remind drivers to slow down. 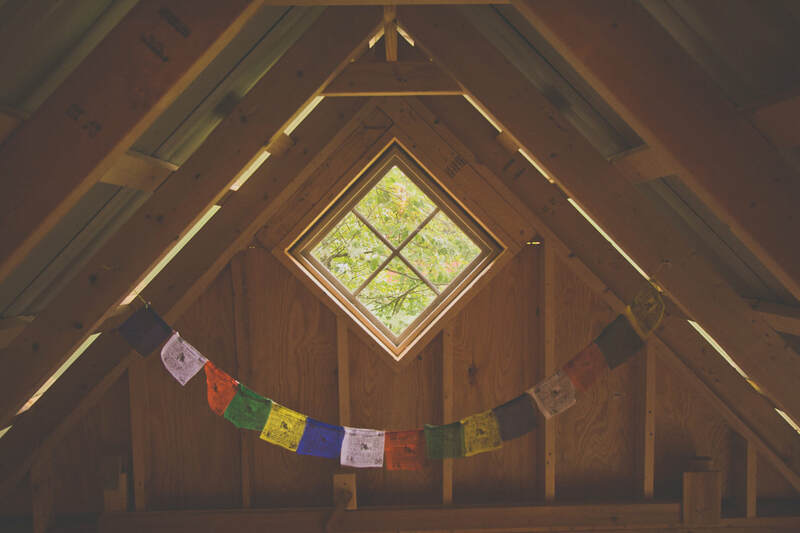 In addition to the projects, I also visited a Trappist monastery with a good friend, found time to both journal and write more as well as reading books by C.S Lewis and Thomas Merton as well as getting our oldest son hooked on the Harry Potter series. My wife Kaitlyn and I celebrated our 9 year anniversary in December and found out with much excitement that we are expecting a girl, baby #3 to be due on August 5th! Needless to say, winter this year has been busy but the busyness has centered largely around those I love and hold close. For the first time in my life, I feel that I have finally placed work and life into balance, my only hope is that I can maintain this balance as work increases this spring and summer. Pictured below is a series of pictures of life at home this winter. As the ground thaws and daffodils bloom, I have noticed a sharp increase in calls for estimates. Currently, I have work scheduled till the middle of April which is both intimidating and exciting. Intimidating as I do not want to stretch myself to far, I only want be busy insomuch as I can provide for our needs and perform quality work while taking the time to know my customers. As I grow as a business owner, I am learning. Often by struggle, how to juggle the constant flow of calls and emails. My goals for 2018 are to fill my schedule with a mix of new installation and repairs. Currently, I schedule a group of repairs between my installations so that I can focus all my attention on the install until its completed. I plan to take about a week off in May for a family vacation and then schedule full month of work in June. For July I plan to only take on small projects and repairs as I will need flexibility with Kaitlyn's due date of August 5th. I then plan to take most of August off and resume with a full schedule (I hope) in September through the remainder of the year. If you're interested in hiring me, I hope you will send me an email or call. I am currently only working with wood and have limitations as to the size of the project (I have no employees so it must be something I can do in a reasonable time without help). I will make every effort to be transparent about my scheduling, costs and details of the project. Even if you're not interested in hiring me, I would value any feedback as to the website, blog and business. The process of repairing a fence starts first with assessing the damage to determine the cause of failure. Oftentimes the failure started out with human factors, such as a vehicle or other large object striking the fence causing it to be pushed out of level. The gravitational pull placed on a post is increased for every degree the post is out of level (plumb), combined with changing seasons with the freeze/thaw cycles, this process of leaning or sagging accelerates rapidly. 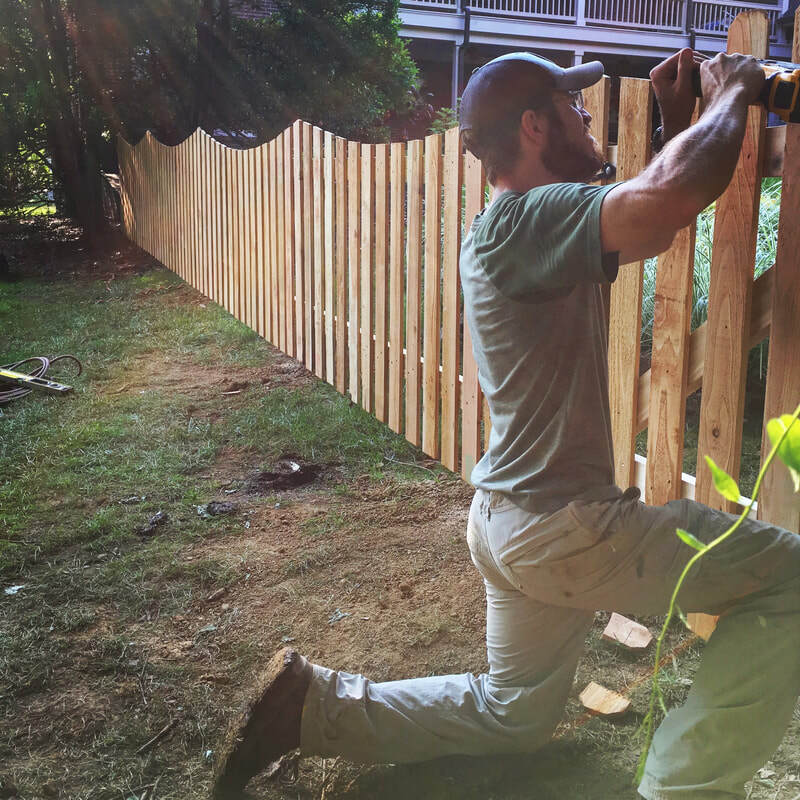 Once a single post is sagging, the force of the fence stresses the surrounding posts causing an entire fence to start leaning. Fences also fail, unfortunately, due to human error during installation. Inadequate post depth, improper pouring of concrete, to little concrete and placement of post in obvious places of drainage all contribute to premature failure of fence posts. My process is then to brace any leaning panels to prevent them from falling before carefully detaching the panels from the damaged post. I typically use a metal blade on a reciprocating saw to cut the nails or screws to avoid having to use prying tools that can damage the 2x4 supports. Once the panels are detached, I dig a hole beside the exiting post until I reach the bottom of the post, I then carefully pry the concrete plug out of the ground. If the concrete plug will not move, I will then break it by using a sledge hammer and remove the individual chunks of concrete. Once the damaged post is removed, I run a string that is attached to the remaining good post. I then place a new post, set to the proper depth and have it lined up to the string while using a level to ensure its completely plumb on all sides. Concrete is then poured, filling the entire hole and surrounding the post. Once the concrete has cured (2-3 days for regular concrete, 4 hours for "Fast setting" concrete), a string is ran along the top of the fence and the panels attached with the tops following the top of the string to ensure consistent flow of the top pickets. Replacing fence post constitutes the greatest percentage of repairs that we make. 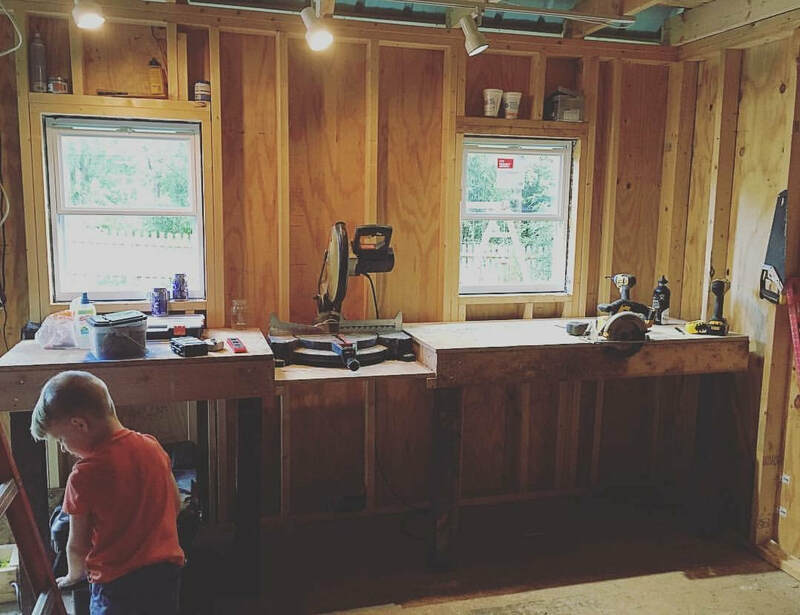 The process as outlined in this blog post is very straight forward and can be accomplished by the willing homeowner with the most basic of tools and a willingness to get dirty. 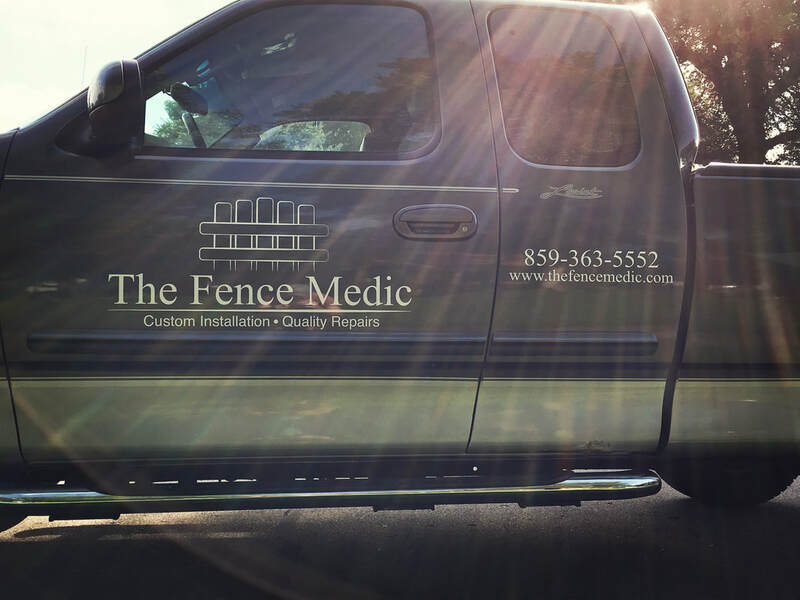 If you would like a quote from the 'Fence Medic', we would love to look at your project and provide a free quote. We take pride in maintaining a clean job-site, we want the only sign of our presence being a strong, straight fence! What a busy two weeks its been! Between the work I have done in Lexington, partnering with the "Fence Guy of Louisville" to help him get caught up, going part time at the hospital, starting a part time job at a small county EMS service and running a business. I must say, its been busy but I love the variety, the challenges have been stimulating and the people have been amazing. The most memorable moment in the past two weeks was this 6' tall privacy fence I built for a client. 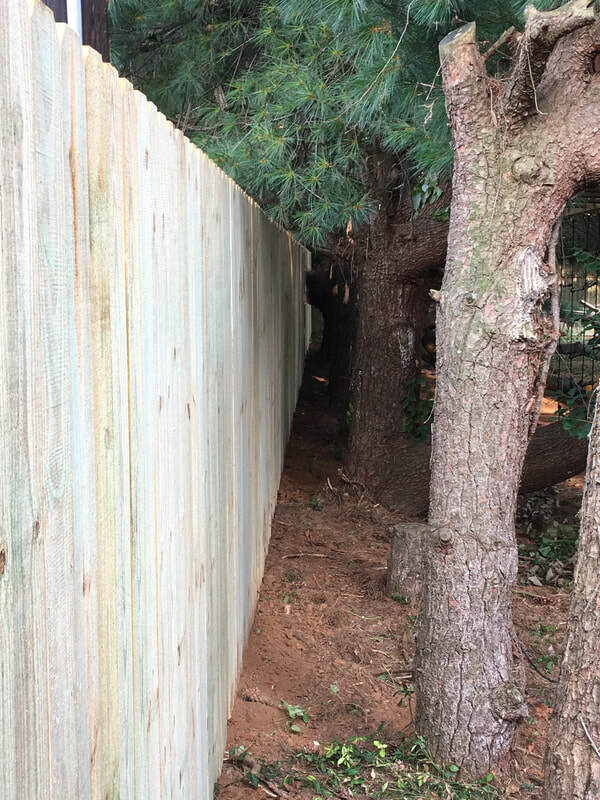 I used pressure treated pine for the pickets and had some unique challenges to work around, most notably a large tree branch that she will eventually have removed but needed a secure fence to keep her dogs in. I placed the fence to fit around this branch, built that section with screws so it can be removed and used a jig saw to make an opening to fit around the tree branch, allowing room for the branch to flex and move. Everything about this project went better than I had planned. I spaced the post to fit between trees as much as possible, reducing the number of roots needing to be cut. 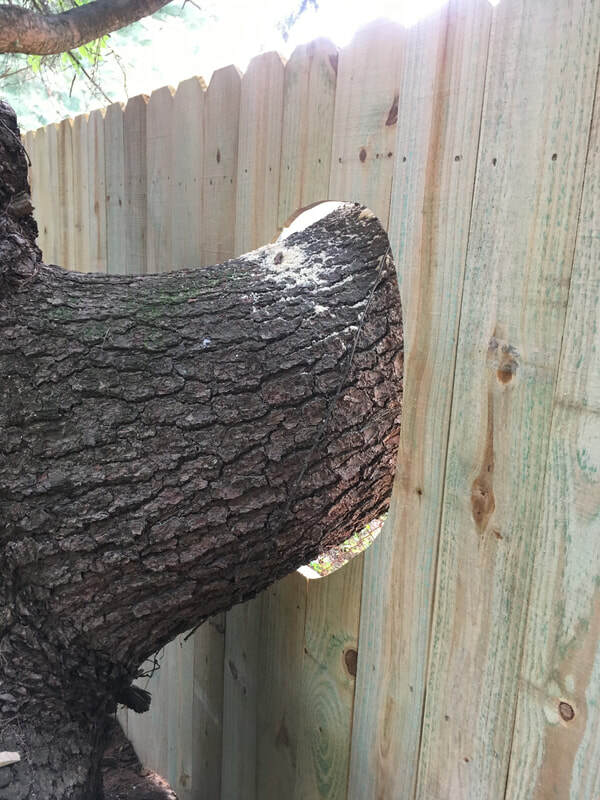 With some trial and error, adjustments were made to the string used to layout this fence so that the middle and top 2x4 supports would fit around the large tree branch and allow the fence to fit under another branch. I had plenty of shade to work under during the heat wave and had a wonderful client. I hope this fence provides the privacy and security she was needing! Partnering with the Mike ("The Fence Guy of Louisville") has been a great opportunity to learn new skills and receive constructive criticism. 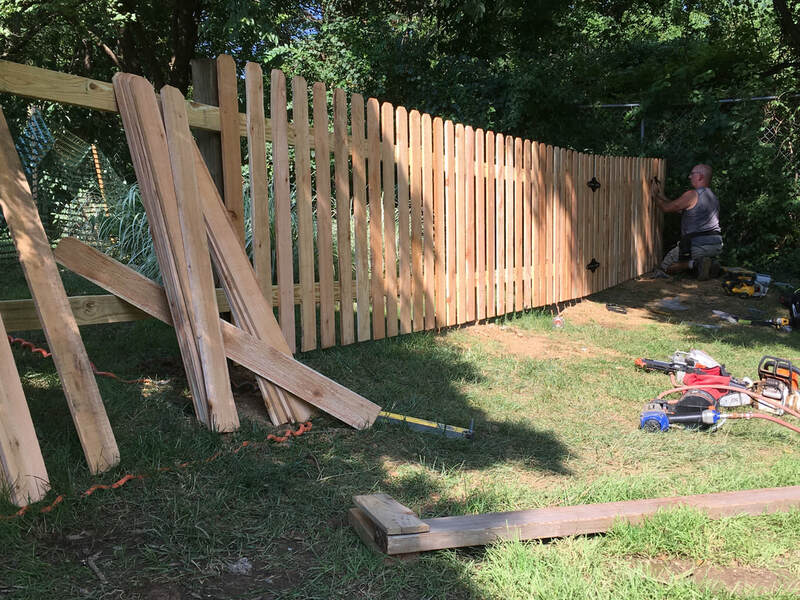 Mike strongly advocates on appearance over numbers, meaning that if the spacing of a picket is exactly 2" then some posts will be seen when looking at the fence. Mike taught me to slowly make adjustments at 1/8" to 1/4" of an inch at a time to conceal each post while giving the appearance of perfect spacing. Mike takes this approach to everything when building his fences, he says that variances in spacing between pickets, posts and the top of the fence must be made gradually. He also possess an obsessive commit to quality, if a single post appears off, he will remove it and set a new post, even if it means delaying the project. One area of fence building I have been nervous about is cutting arches and scallops. I have simply not possessed enough practice to feel comfortable taking a saw blade to something I have worked so hard to construct. The only way to improve is to practice, here I am cutting scallops in a 4' spaced cedar picket fence. To have the scallops flow consistently requires first tracing a line using a flexible piece of trim work. Adjustments are then made and if a mistake occurs while cutting, you readjust back to the line slowly, not abruptly to keep the flow consistent and appearance fluid. I will finally conclude this rather lengthly update with that which truly matters. Life with those we love. As I learn and grow as an individual, I slowly learn, most often from my mistakes, that its the seemingly little and insignificant elements of life that we will one day reflect upon and esteem as the most precious. I have found a lot of happiness in working hard, learning a craft that I can apply my own artistic style to while running my own business. Ultimately, these fences will one day fall down, someone will come back and build atop of what I constructed and haul it away to the dump. So also will our children grow, our parents age as this present day fades away. What truly matters, I do believe, is not what we do with our careers insomuch as what we do with our hearts, our time, our love. The most important career objective I have is to stay small enough to never detract from what truly matters! Time is but the stream I go a-fishing in. I drink at it; but while I drink I see the sandy bottom and detect how shallow it is. Its thin current slides away, but eternity remains." 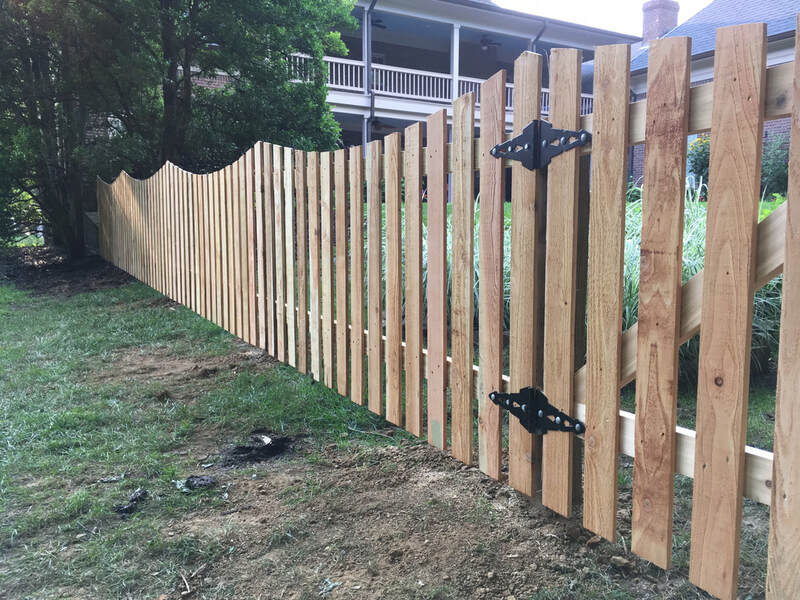 The key to building a gate to last more than a few years is to design it as small as reasonable, construct it as light as possible and secure it a strong and solid structure. 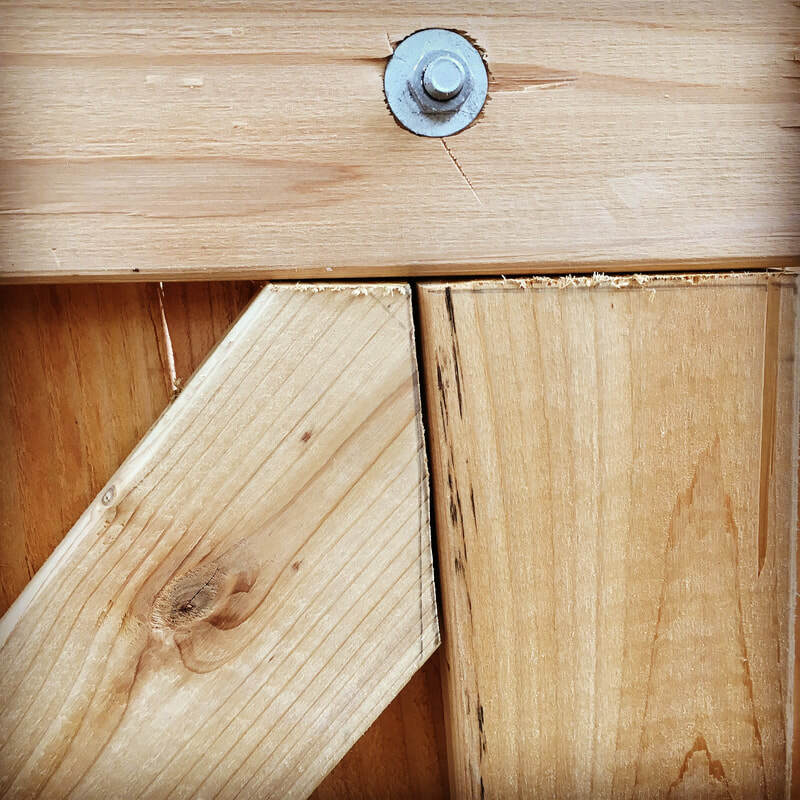 When building gates, we use lightweight cedar for the framework and pickets, cedar is significantly lighter than pressure treated pine and is naturally rot resistant. We then secure our gate hinges with 4 inch lag bolts into either a 4x6 or 6x6 post set with 160-200 pounds of concrete per post. Building a gate to last as long as the surrounding fence takes time and patience and does not happen by chance. While there is additional cost in building a strong and light gate, we believe its a worthwhile investment. If you are having gate problems or would like a free estimate on replacing a problematic gate, feel free to give us a call! After a long process of trying to find a reasonable company to design, print and install vehicle graphics on our truck, we are finally finished! We used Image360 here in Lexington. We had to wait a few weeks to get everything installed but the entire process from the initial consult to the design and installation went flawlessly. Their prices were very reasonable and we are very pleased with how it all turned out! Our youngest son can be seen offering his critique. This is what the driver and passenger side doors look like. My artistic and talented wife designed the picket fence logo at the kitchen table a few months ago. I scanned it into a PDF and Image360 was able to refine and incorporate the logo into this vehicle wrap. I love how the process of building our business has also turned into a family project involving so many friends, coworkers and neighbors. The vehicle graphics were finished at the perfect time on Friday. I am working my last full time shift at the hospital on Saturday before going to part time status and becoming 'The Fence Medic' full time. I have a small job planned for Monday and Tuesday of next week and plan to work with Mike Watkins, owner of 'The Fence Guy of Louisville' later next week to help him get caught up on a few jobs. If you have any fence or gate projects that you would like help with, please consider contacting me. I am licensed and insured, I offer a generous warranty for new installation and will do whatever it takes to build a reputation for doing quality and honest work! If I said I was not afraid, I would be totally lying. Fact is, its 1:30 AM and I am sitting at my messy desk entering receipts and numbers for the month of June. The house sleeps, even Cami, our chocolate lab gave up waiting on me and retired to her bed. Why am I doing this if I am so afraid? I have asked myself these questions nearly everyday of my life. I recall climbing a rock wall for the first time when I was 8 years old at Kings Island. It looked incredible, until I was 20 feet up and nearly went catatonic with fear and begged to be lowered. That rock wall stayed on my mind and I wanted so badly to try it again. Though I have always been terrified of heights, I kept climbing every chance I could find and found that the majority of my fears were not based on actuality but rather imagination. A few weeks ago I was climbing a classic Red River Gorge climb called “Bed Time for Bonzo” with my good friend Tim. About 100 feet up, the route made a turn onto a ledge before following a crack to the summit. Once on the ledge, I stopped and looked down and I froze with fear. My hands started trembling, I wedged a piece of protection into the crack and then I shoved another cam behind it. I stayed on the ledge too long, the longer I stood the more rampant my imagination ran about the trajectory my falling body would take if all my anchors failed or my rope broke. I imagined myself breaking my neck, shattering my spine, puncturing a lung before going unconscious. 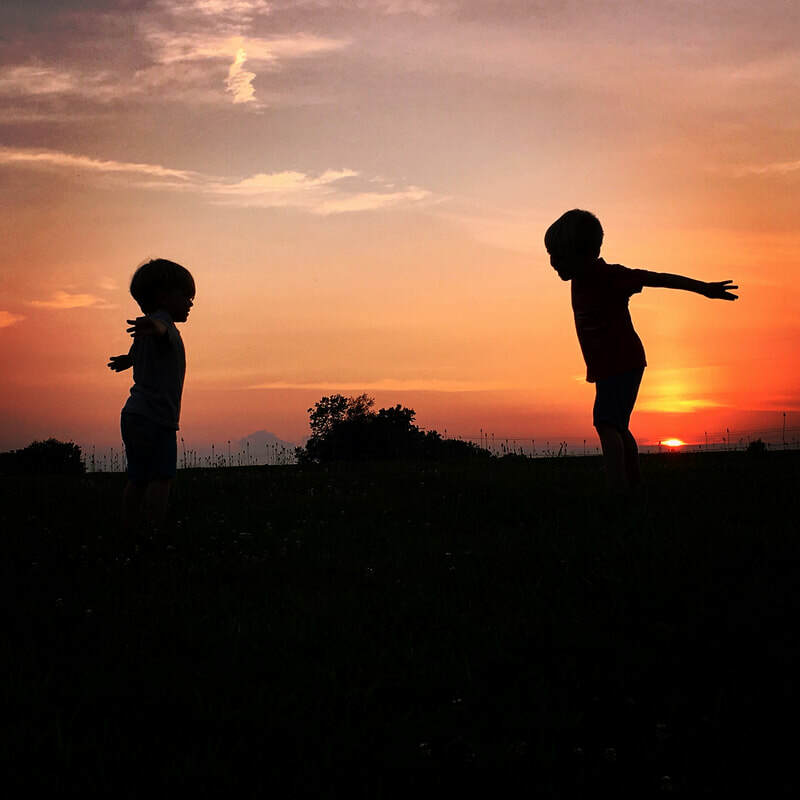 The mental imagery became really awful as I thought about how my wife and children would react in my fictional mental situation. I then stopped my destructive train of thought and looked at the incredible sunset to my back that I was neglecting. I took a deep breath and reflected on the reality that my probability of having an accident would be greatly increased by attempting to retreat downward. In the words of Robert Frost, “The only way out is through”, so I took the gear I had left, I leaned back and climbed upward off the ledge and 5 minutes later I was at the top. I put Tim on belay and a few moments later we watched as the sun disappeared in a sea of orange clouds as the valley floor below us slowly covered with fog. Climbing has afforded me this moment and so many more like it that I simply won’t ever forget. So why am I doing this? Why am I walking away from a reliable paycheck, job security, retirement and everything that just makes sense? Because life is precious, its short and I want to live to see the view from the top, even if I am terrified. I want the freedom to have just a few more minutes with my kids. I want to work hard with my hands, I want to build our own reality, our own dreams. What if it all crashes down? What if the phone does not ring and jobs don’t come? What if I make mistakes and fail? What happens if I mess up our taxes? What about the things that I know I should be worried about but I don’t know what they are yet? These are all thoughts that I have at 1:30 am and maybe I am wrong, crazy or delusional but I feel strangely confident that Frost is right, the only way out is to simply push through this.